Are you doing any social media posting, email marketing, social ads, or pay per click (PPC) advertising in an effort to drive more activity to your practice? Would you like to increase subscribers to your newsletters and emails? Are you offering a new service that you’d like to launch and sell? A landing page is a key marketing strategy, in which an independent web page is created as the target for a campaign (such as an email, social, or ad). By stripping away distractions, landing pages focus your visitor on a single call-to-action, optimizing conversions for a singular transactional purpose. Read on to learn more about what a landing page is and how you can initiate or improve your landing page strategy. If you are doing any social ads or search engine ads, or you want to increase subscribers to your newsletters, or perhaps you want to gain traction for a key new service you are providing, a keyword-rich and attractive, custom landing page or microsite will accelerate your results. Landing pages help you collect leads for your practice. They are targeted pages, specifically built to achieve a stated goal. 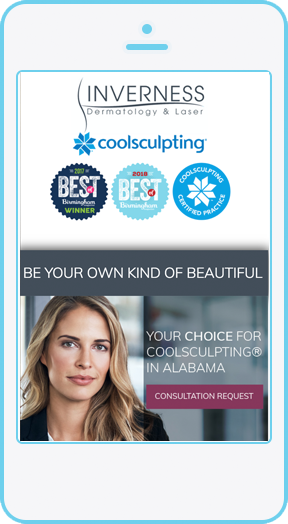 For example, your goal may be to collect email addresses of people interested in CoolSculpting® or HydraFacials®. Or, your goal may be to sell a Pampering Facial in order to bring more clients into your practice, where you can upsell additional services to them. One thing that is the key defining principal of a landing page is the singular purpose. 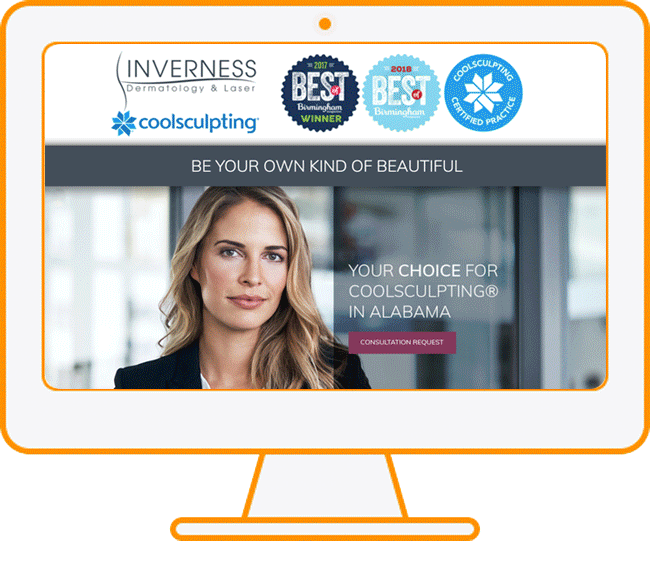 Click on the image below to see an animation of an effective CoolSculpting® landing page, or visit https://www.coolsculptingalabama.com to visit the page. The home page of your website is not a landing page, and it is not an ideal target for your email campaign, social post, boosted post or PPC ad. It will generally not produce healthy conversions because there is too much information that is unrelated to the specific topic that drove the visitor to click through to your site. The homepage of your website probably offers general information about your practice, a menu with a variety of options for visitors to navigate throughout your site, and multiple calls-to-action. By definition, your homepage is not focused on a singular purpose. 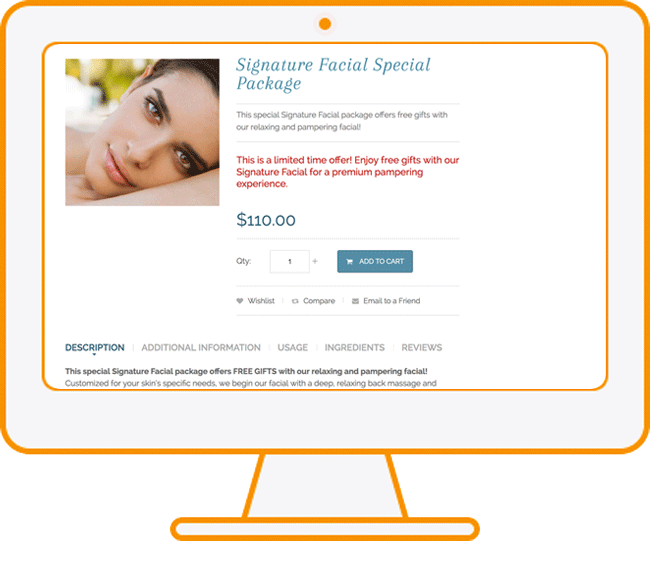 DermPRO’s core business is ecommerce, so often we will encourage our clients to utilize product or service SKU pages on their online stores as campaign targets. These are pages where a product or service is offered, with detailed descriptions, photos, before and afters, and a purchase button. These are better landing pages than the homepage of a website, because they are usually focused on a specific topic, and have a built-in, singular call-to-action in the “Add to Cart” button. When you can target an ad to a page where the visitor can learn more specifically about your Special Facial Package and can purchase the special facial online, analysis has shown that this can double conversion rates over homepage targets. A specialized landing page, though, has additional features that make it even more suited to effect conversions. An ideal landing page can be optimized for your topic by excluding the standard header and footer that are used on your main site or store, and stripping away the website navigation in order to reduce distractions. Another fundamental element of a landing page is an easy to use consultation request form with minimal fields, providing your visitor with a ready call-to-action. A properly implemented consultation form also helps you track results. Typically this will be a Free Consultation Request or Appointment Request form, although it could be an Add to Cart button for special promotional offer, or simply an email capture field. “Long-form landing pages” with compelling copy and high keyword density have been shown to more than double the leads over shorter “above-the-fold” landing pages. Mobile website traffic has exceeded desktop traffic for several years; your landing pages absolutely have to look great and work great on all devices. Landing page videos have been shown to increase product purchases by 144%, according to Internet Retailer. While most generic, stock photos are ignored, purposeful images such as before and after images and images of your provider or practice add value. Social proof is an extremely powerful way to overcome skepticism and doubt. Certifications and credibility indicators should be offered, providing compelling reasons why your practice stands out above the rest. Use your social accounts to demonstrate the vibrancy of your practice and give your visitors up-to-date information about events. Use your landing page as a target for a well-thought-out PPC ad. You will optimize conversions, increasing results as much as 5 times over sending people to your homepage or other webpage targets. A well-executed landing page can improve your AdWords Quality Score, which can improve ad placements and lower your ad costs. Take advantage of marketing funds offered by your manufacturer partners. Many of your partners will reimburse your practice for a large portion of your costs to implement a targeted campaign, including the cost of building the landing page and the ad budget. Follow the best practices outlined in this post. You’ll see the difference in your results. Consider an attractive discount, purchasable online, as your call-to-action on your landing page. 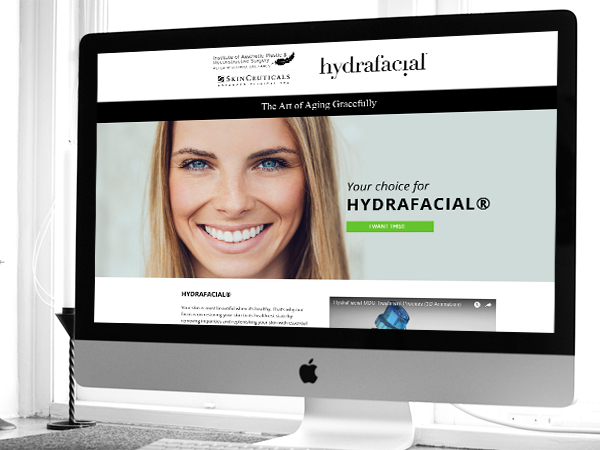 Contact DermPRO to see how easy it is to implement ecommerce for your practice. Tip: A specialized landing page not only increases conversions by more than 5 times, but can improve your AdWords Quality Score, which can improve ad placements and lower your ad costs.